The Massachusetts Attorney General is an elected constitutionally defined executive officer of the Massachusetts Government. The officeholder is the chief lawyer and law enforcement officer of the Commonwealth of Massachusetts. The officeholder also acts as an advocate and resource for the Commonwealth and its residents in many areas, including consumer protection, combating fraud and corruption, protecting civil rights, and maintaining economic competition. 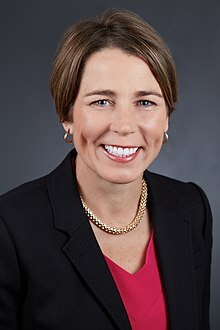 The current Attorney General is Maura Healey. When the 1780 state constitution was first enacted, the Attorney General was appointed by the Governor, with the advice and consent of the Governor's Council. The office was abolished in 1843 and re-established in 1849. In 1855 the constitution was amended so that the Attorney General (along with a number of other constitutionally enumerated offices) was elected by the people. The length of the term of office has matched that of the governor, and elections are held concurrently with those for other constitutional office. Elections were first held annually, became biennial (every two years) in 1920, and quadrennial (every four years) in 1966. The Office of the Attorney General is organized into six Bureaus: Executive; Energy and Environmental; Criminal; Government; Health Care and Fair Competition; and Public Protection and Advocacy. Each bureau is divided into divisions and teams. These Bureaus and Divisions have distinct missions, but work closely together to ensure the Attorney General’s Office provides the highest level of public protection. Vacant Office Abolished from 1843 to 1849. This page was last edited on 4 November 2018, at 13:30 (UTC).